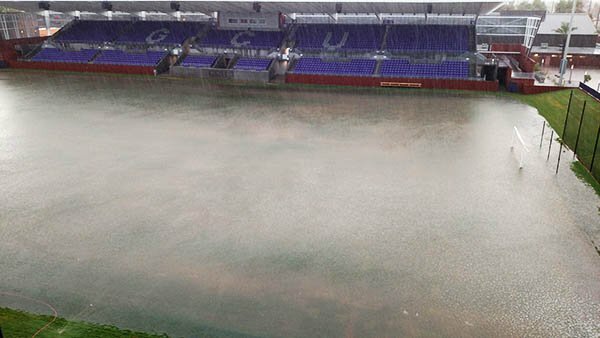 The field of GCU Stadium took a lot of water in a short time in Tuesday’s storm but drained quickly and was back to normal the next day. Grand Canyon University employees who were soaked by Tuesday’s severe thunderstorms and then battled floods, closed freeways and other hazards during a nightmare commute home were greeted Wednesday by sunshine and a campus returned to its pristine beauty. 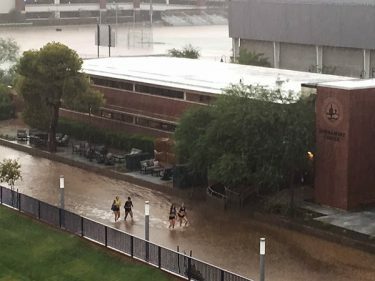 The impromptu lakes and rivers that transformed GCU into a marsh filled with knee-high water in some places had receded Wednesday morning. Gone also was the chaos that staff and faculty faced in one of the most difficult evening commutes in recent memory. Students wade through the water that engulfed parts of the campus during the storm. GCU was at the epicenter of what the National Weather Service called a “100-year storm” because there is only a 1 percent chance of it happening in a given year. The area along Interstate 17 near GCU got hit hardest by the deluge, which dumped nearly three inches of rain in two hours at the height of the evening rush. “Three inches fell inside of a mile here and flooded the freeway, flooded us and flooded everything around us, but we made it,” said GCU Police Chief Kenneth Laird. The University was ready for the sustained drenching, said Richard Oesterle, director of campus development. Dozens of facilities employees and public safety employees were out in force, and an outside water-extraction company was called in. The rainwater that found its way into some buildings was quickly removed. Oesterle said the rain also caused about a half-dozen sink holes, and one of them, near the Papago Apartments, was about 6-8 feet deep. Public safety officers distributed buckets, put red cones around sink holes, cleaned clogs from storm drains, directed traffic and more, according to Sgt. Dan Miller. One employee’s car floated onto a curb, and another’s vehicle broke down behind The Grove residence halls.